On the last day of each month invoices move from the Current to the Closed/Unpaid state. If your 3Play Media profile has Billing & Invoice permissions enabled you will have the ability to pay an invoice directly from the account system once the invoice is listed as Closed/Unpaid. At any time Current Invoices can also be closed manually and then paid should invoices need to be paid before the last day of the month. Follow the steps below to learn how to pay an invoice directly from your 3Play Media account. After Billing is clicked you are directed to the Invoices section of your account or project Billing page. If you have any outstanding invoices you will be directed to the Closed/Unpaid Invoices tab by default. Locate the invoice you would like to pay and click Pay Now located under the Actions. Under Amount select Pay in full to pay the entire amount owed for this invoice. If more than one credit card is on file, select the credit card you would like to use to make this payment. Once you have selected one of the credit cards on file in your account, click Pay Now. 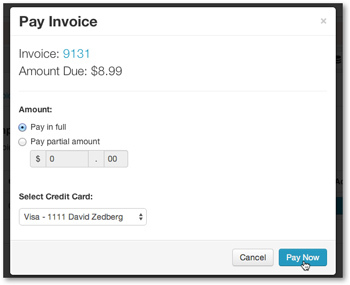 If the full amount due is paid, the invoice will move to the Paid tab on the Invoices page. If a credit card is not listed on file you will prompted to add one before being able to pay an invoice. If you do not want to pay the entire invoice you can make a partial payment towards this balance. To do this, select Pay partial amount and enter the amount you would like to pay towards this invoice. Upon making a partial payment a receipt is emailed to billing contacts. The invoice will remain Closed/Unpaid until the entire invoice is paid. Partial payments will be indicated on the invoice towards which the payment was made.